Have you been seeing 666 everywhere lately? 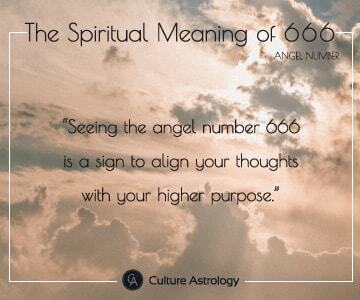 Are you wondering whether 666 is an angel number just like 444 or 333? The number 666 has gotten a bad reputation in the past and for many people seeing 666 evokes extreme fear and uncertainty. This number has been perceived as the "devil's number" for centuries and even the 666 meaning in the bible is that this is the number of the wild Beast that has seven heads and ten horns. In popular culture, 666 is the symbol for the devil and it is almost always associated with darkness and considered to be a bad sign, so you're probably asking yourself: "What does 666 mean?" The truth is that seeing 666 isn't a bad omen - in fact, this number is a reminder to release any fear and worry you may have in your life. When the angels are showing you this number they want you to stop focusing on material possessions and things and listen to your inner voice. The infamous 666 is actually a wake-up call from your guardian angels, telling you to focus on being present in the moment and become more spiritual so you can allow healing of your body and mind and increase the level of joy and happiness in your life. If you're seeing 666 often, then you should pay attention to your thoughts and actions at that time. Are they aligned with the Universe? Your thoughts become your words, and we all know that our words have high energy vibrations that create the reality that surrounds us. So, when you see this number again, remember that if you want to create a better reality for yourself, you need to start with changing your thoughts and your actions. Change the direction of your thoughts because when they're not aligned with the Universe, you can feel pain or discomfort. On the other hand, when your thoughts are balanced and are in alignment with the Universe, you feel happier, peaceful, and more creative. 666 usually appears as a wake-up call from your guardian angels, but, what is exactly the spiritual 666 meaning? The angel number 666 you keep seeing everywhere brings energies that symbolize peace, empathy, generosity, and selflessness. It is highly associated with volunteering and charity, which means that the angels want you to be kind and curious about the needs of others and always be willing to help them. They want you to use your inborn gifts and talents to help other people, and the Universe will ultimately reward you for your kindness and bestow many blessings upon you. Another meaning of 666 is that the angels want you to trust your intuition more and find peace, especially if you're going through a difficult time. If you see this number and you're going through something bad, know that your guardian angels want to guide you and help you. This number is a sign that if you pay attention to your inner voice and think positively, soon your life will change for the better and you will overcome the bad times. Seeing the number 666 also mean that you need to start focusing more on your spirituality. The most important spiritual meaning of 666 is that the angels want you to find balance, peace, and stop being negative because positive thinking is the key to a happy and fulfilling life. Focus on becoming a more spiritual person, and you'll deal with the difficult situations in your life a lot easier. Why is the number 666 so special? The number 666 reminds you to regain a sense of balance in your thoughts and actions. Have you been too focused on materialistic things and neglected your friends and family? Have you been thinking too much about yourself and too little about the other people in your life? Have you lost touch with your real self? If you keep seeing this number and answered positively to any of these questions, start making changes to be the very best version of you. Number 666 asks you to develop a humanitarian spirit, to help other people in need, to be humble and live your life with simplicity, as well as being more grateful for everything you have in your day-to-day life. This number indicates that if you're willing to change your thoughts, your life will also change for the better. The number 666 is also a reminder to pay more attention to your health and your needs. So, seeing this number regularly may be a simple reminder to stay hydrated and drink more water, or to take a break and relax your mind. So, now that you know all about the significance of 666, open up your heart and mind to accept the guidance and help from your guardian angels and be ready to receive all the good life has to offer.